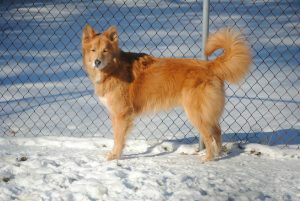 Karma Schobert is a 10-year-old Golden Retriever mix and a kind, old soul. According to her parents, Elizabeth and Joe Schobert, she is the perfect model of living each day to its fullest. Karma was diagnosed with malabsorption syndrome as a young puppy and therefore is chronically underweight. She lost her pet sibling four years ago to a double fungal infection and became depressed until the Schoberts adopted a new puppy, Esme. Last year, Karma tore her ACL. Then, late last year in December, Karma was diagnosed with nasal cancer. 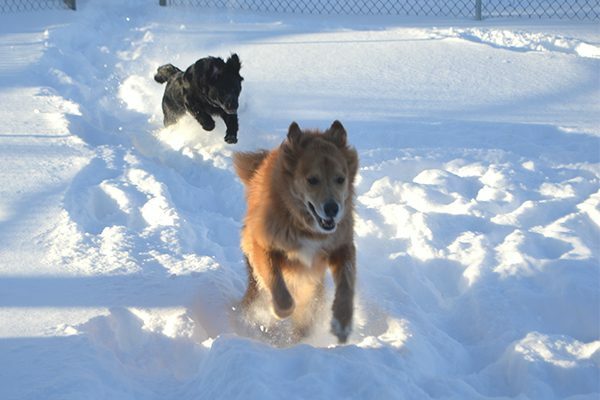 But through it all, the Schoberts say Karma hasn’t lost her love of play. 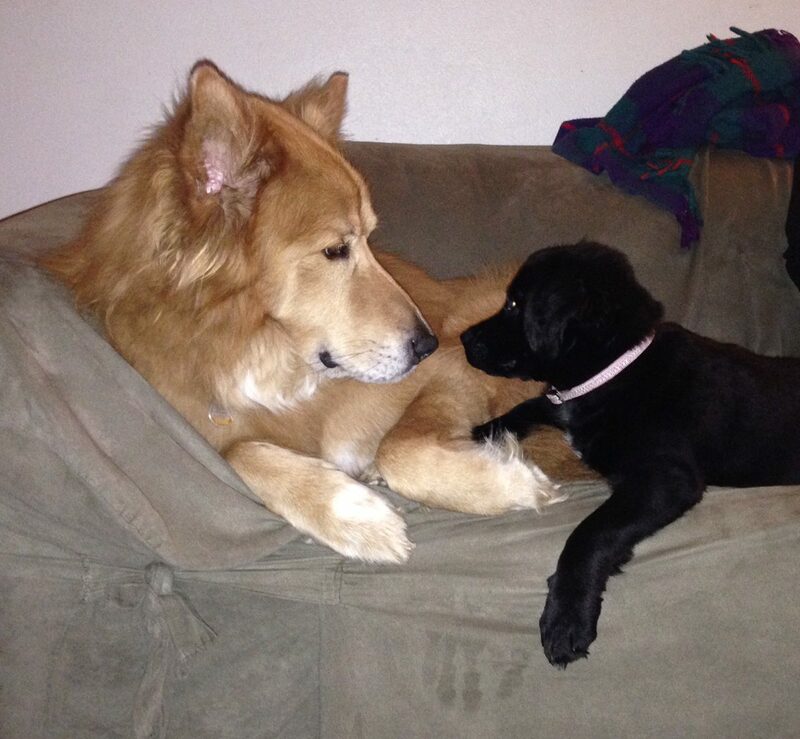 She still romps around with Esme and bosses around anyone who sits in her spot on the couch. In late November of 2017, Elizabeth noticed that Karma’s right eye was protruding. In hindsight, Elizabeth realized Karma must have been in a great deal of pain. She wasn’t howling or hiding away, but her behavior was subdued, and she had low energy. The Schoberts took Karma to see her primary care veterinarian, who took an X-ray. The results were inconclusive, so they were referred to an oncologist, a cancer specialist, at a nearby specialty hospital, Lakeshore Veterinary Specialists in Glendale, Wisconsin. A CT scan and biopsy were performed. The CT scan revealed a large mass within her nasal cavity and behind her right eye. Although the biopsy did not yield a definitive diagnosis, Karma’s oncologist was highly concerned that the tumor was cancerous and likely a sarcoma. Due to the location of the mass, surgery to remove it would be impossible. Stereotactic radiosurgery (SRS): This advanced radiation therapy treats the tumor by delivering radiation with sub-millimeter precision to kill the tumor cells. The radiation is precisely aimed with CT guidance. Treatment is given on three consecutive days. If successful, Karma would have an estimated 18 additional months with improved quality of life. Palliative radiation therapy: This is a lower dose of radiation and is given to ease pain associated with the tumor, but it is unlikely to actually kill tumor cells or shrink the tumor. Treatment is given weekly for three to four treatments. Chemotherapy: This is a drug therapy given to try to slow down the growth or shrink a tumor. Unfortunately, as suspected, Karma’s tumor turned out to be a sarcoma. The chance of a good response to chemotherapy from a sarcoma was estimated at just 20%–30%. 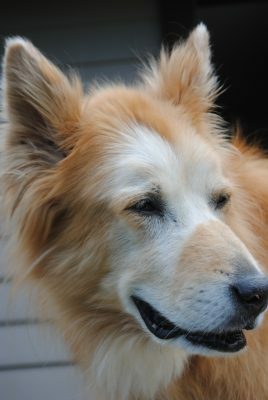 Elizabeth explained that if Karma had not been diagnosed with cancer, she might not have lived much longer since she was already an older dog. Without treatment, she was given about three months. For the Schoberts, not pursuing treatment was not an option. “We felt that we had a good chance of giving her more quality time. The doctors said that the results would be 18 months. That’s about the rest of her life. If we could offer her this time—quality of life—we were going to do that for her,” said Elizabeth. “If I’m going to give my daughter surgery on her knee, I’m going to give Karma radiation therapy. She’s part of the family,” Elizabeth added. Karma received three sessions of SRS on January 16, 19, and 20, 2017, at PetCure Oncology at Lakeshore Veterinary Specialists. Because the Schoberts live close to the hospital, Karma went home after every session. She had no side effects except for hair loss at the treatment site. Elizabeth said that the hair has grown back a little whiter, but the family feels that it adds an “air of distinction.” They gave her a new nickname of red panda or refer to her white patch as her “Phantom of the Opera” mask. As of June 14, 2017, we are happy to report that Karma’s eye is back to normal. Her eyesight was not affected by the radiation. She does have an occasional nasal drip, but her veterinarians are keeping a close eye on it. The Schoberts are thrilled to have Karma with them for longer and that she’s been acting like a younger dog. Karma is enjoying wrestling matches with Esme, eating her greenies (her favorite treat), howling at sirens, and lying in the sun.